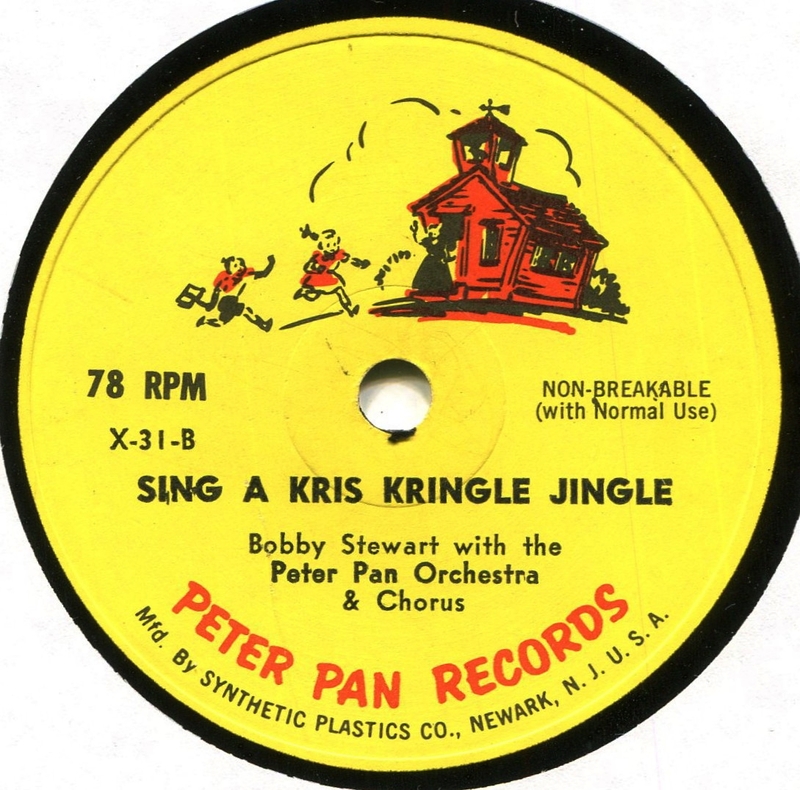 From 1969, a "Play a Story Book" with a 7-inch 33 1/3 single included. The illustrations, by Myrtle H. Troaster, are gorgeous, and they're interspersed with the sheet music for "A Christmas Dream,' which is written in the key of C but sung in G.
Tiny Tyke Toys, Inc. of Salt Lake City, Utah, was responsible for this give-away (? 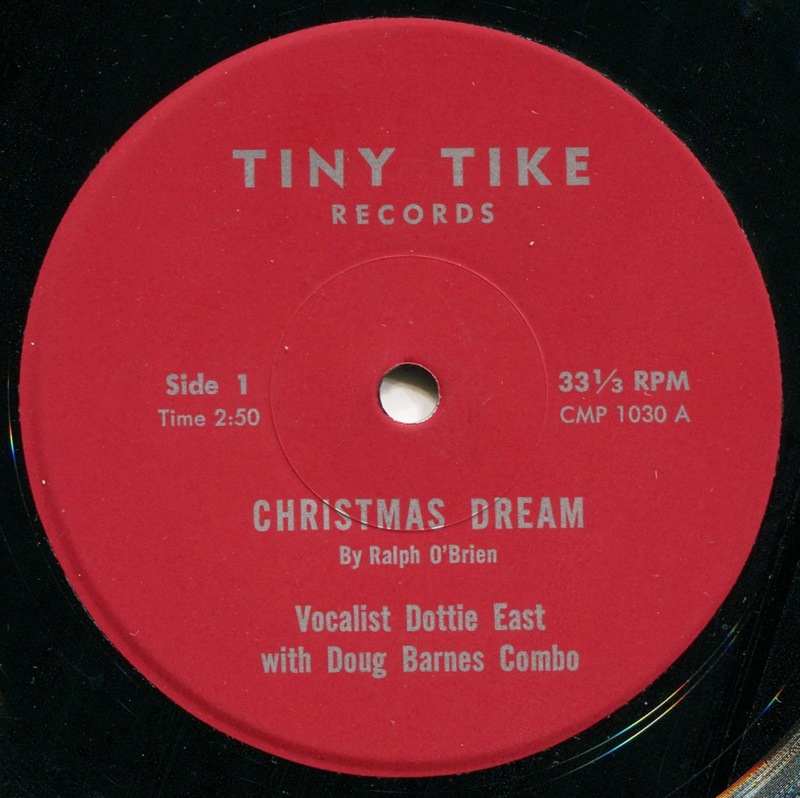 ), though the label spells "Tyke" as "Tike" ("Tiny Tike Records"). 'Tis a mistery. 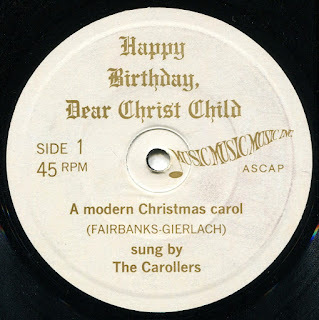 Pleasant songs, pleasant singing, and it's kind of cool to see something this 1940s/1950s-style come out in 1969. Nowhere near Line Material level, but better than many such company vanity efforts. Someone should do a compilation of kids-falling-asleep-and-meeting-Santa songs. You could get two volumes out of them, probably. 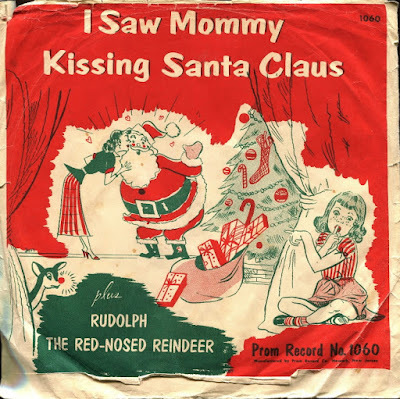 This one is all about the picture sleeve, though the versions of "I Saw Mommy" and "Rudolph" are pleasant enough. On the former, the kid vocalist--Davey Piper--sings it straight (no "Aren't I cute?" attitude in his voice) and, unlike the singer in the Big 4 Hits version, he can hold a tune. It's an unusually matter of fact rendition of this awful Christmas standard. Some groove issues at the start of "Mommy," but things quickly adjust. 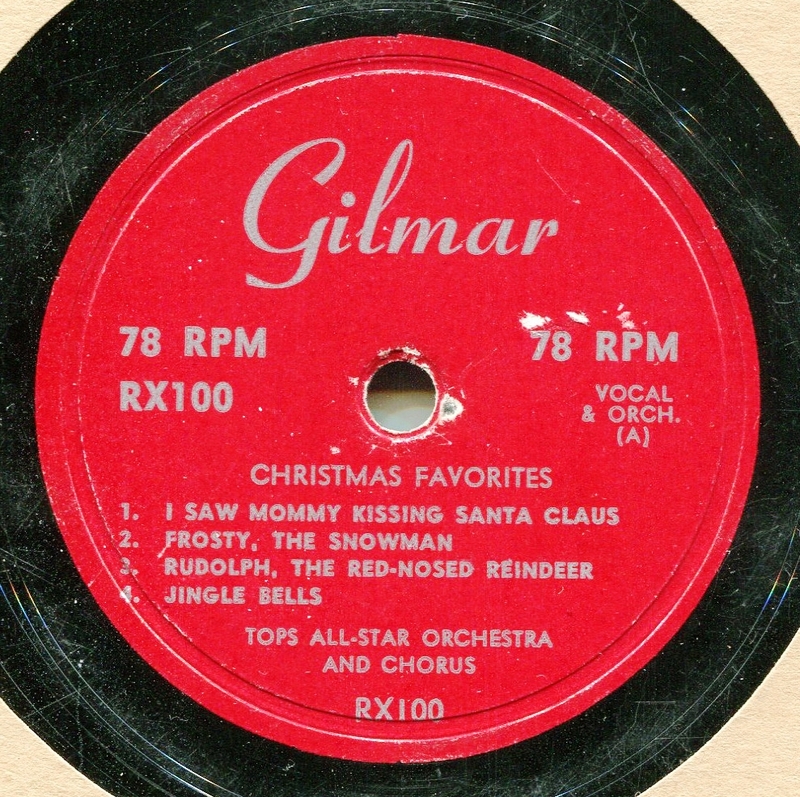 At some point during its life, this 78 rpm disc may have been played on a gramophone for ten seconds or so. Whatever the case, the temporary wear is highly visible. But Davey Piper soldiers on through, and past, the noise. 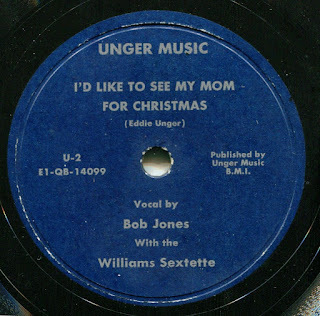 Click here to hear: I Saw Mommy, etc. 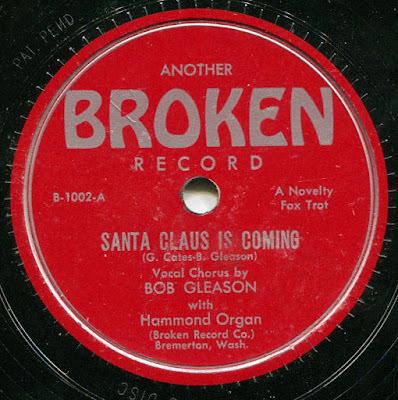 Another Broken Record for the fifth day of Christmas--"Santa Claus Is Coming"
Strange but cool name for a record label--Another Broken Record. And it almost become one--the center hole is so small, I had to force it on and off the spindle. But, luckily, the disc (despite being a 78) is some kind of hard plastic rather than shellac, so it could withstand the twisting. 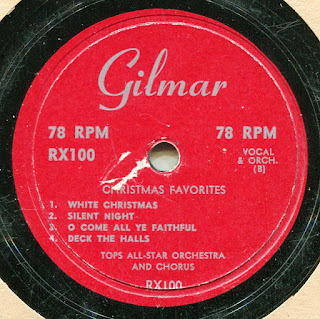 Two nice, humble Christmas sides from 1949. Never heard of Bob Gleason, but he had a fine voice--and he co-wrote both sides. I'm assuming he's not the guy I found when I Googled "Bob Gleason" + "singer." Enjoy this "novelty Fox Trot" today! 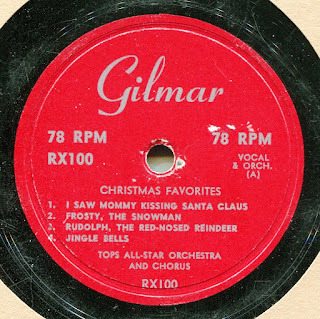 Classic 78s for the fourth day of Christmas! We still have our tree and our porch Christmas lights, not to mention the made-in-Hong-Kong creche displays we're fixing to put up, so it's still Christmas. Actually, it IS, come to think of it. The second day of the 12 Days of Christmas, to be exact. Good grief. How could I have forgotten that? 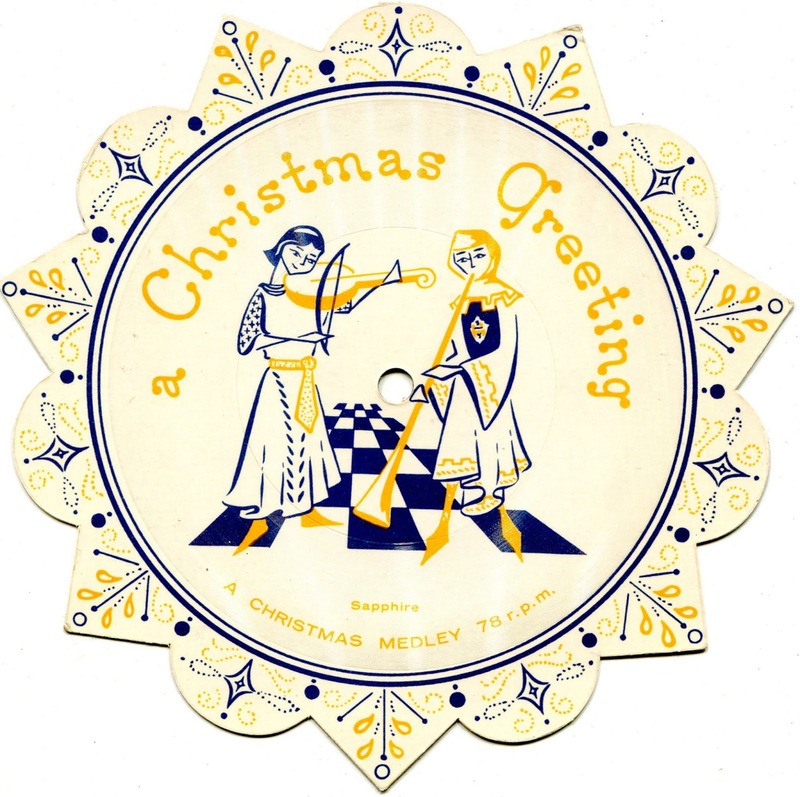 Of these three cheap Christmas picture discs (cardboard backings, thin vinyl coating), only the L&M T.V. 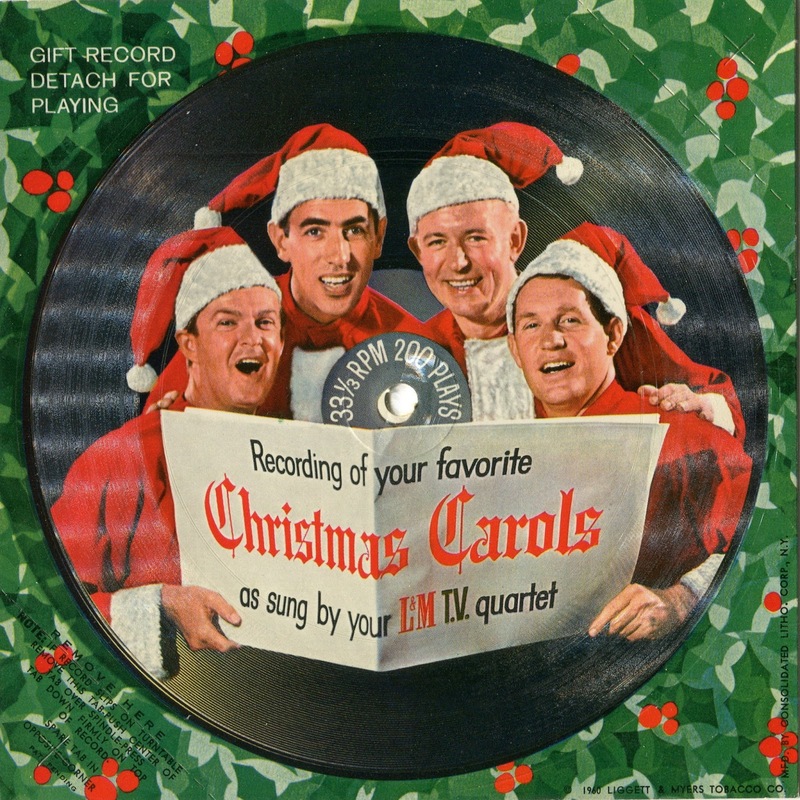 Quartet required a 78 rpm disc (for more solid backing) and Scotch tape to flatten it enough to play. Otherwise, it skipped mercilessly. And I have no idea who or what Sapphire was/is, but memory tells me their disc is the first of its type, so far, to play best with a 78 needle. The first I've encountered, anyway. Oh, and the L&M Quartet side is the first one I've found with a year listed (1960). I find these lo-fi wonders a lot of fun. And dig the bass response on the Pampers side. I can only wonder how they packaged the free disc. On the back of the pack, or...? 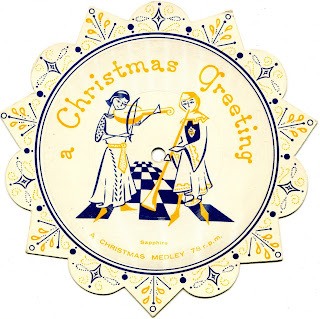 Click here to hear: More cheap Christmas picture discs! 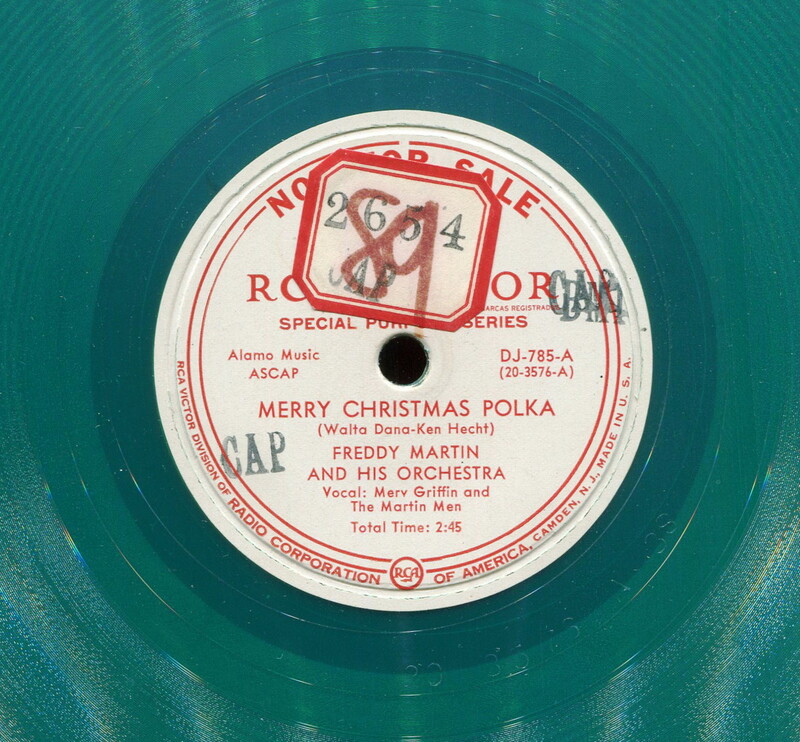 More Christmas singles from my collection--this playlist is a mix of 45s and 78s. Notes: Martin Walker ("I Just Wrote to Santa") is a she, "Little Drummer Boy" (1938) is a completely different tune than the famous holiday number, and the funny "Mistletoe Song" owes more than a little to Spike Jones. Merry Christmas Eve! 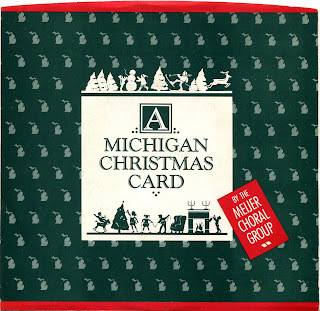 Jingle Bells--I Heard the Bells on Christmas Day--Jeanne Privette, Soprano, RCA Victor Orch. I Saw Three Ships--Once in Royal David's City--Jeanne Privette, Soprano, RCA Victor Orch. 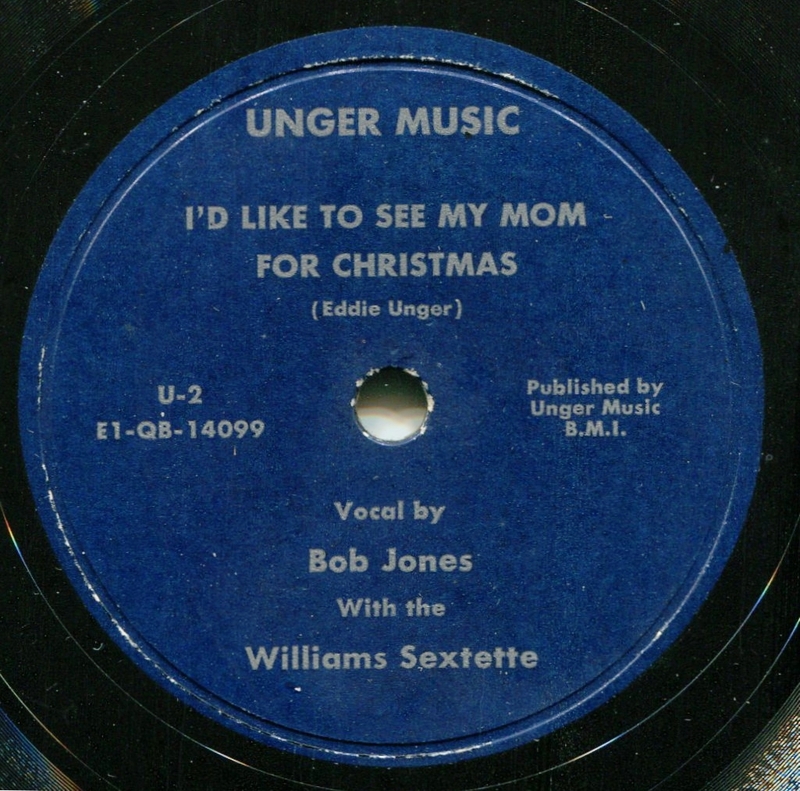 I Just Wrote to Santa--Martin Walker w. Sammy Spear Orch. Cantique de Noel--Martin Walker w. Sammy Spear Orch. My insomnia continues, and I'm running on fumes right now. However, I managed to get a very nice two-hour (or so) nap tonight, and, boy, is it nice to sleep. And I'm on a new med combination that promises to (slowly) correct my sleep problems. Just not overnight. There's a pun there, someplace. At the tiny chapel where I volunteer as organist, we're having our Sunday Christmas Eve service in the morning--which is cool, since temps in the low 30s are coming on that day, along with snow, starting in the afternoon. I'm fine with not driving at night in that setting. I hope lack of sleep doesn't put me face-first on the organ keys, snoring away in the middle of our carol sing, because that would be both embarrassing and unprofessional. "A Service of Lessons and Carols" our pastor calls that section of the service, but I call it our carol sing. 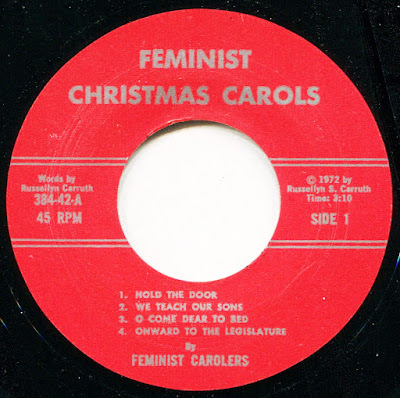 Since this is my blog, "carol sing" wins. I'll remember this as the Christmas of Insomnia. 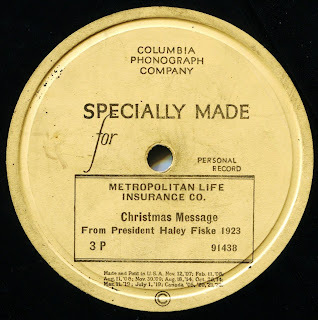 Oh, by the way, I have two copies of Ruby Wright's "Merry, Merry, Merry, Mery XMas," and I wish I'd scanned the labels to show you, because one copy has four "Merry"'s in the title, plus "XMas," whereas the other copy simply says, "Merry, Merry Christmas." Exact same recording, record label, artists, etc. 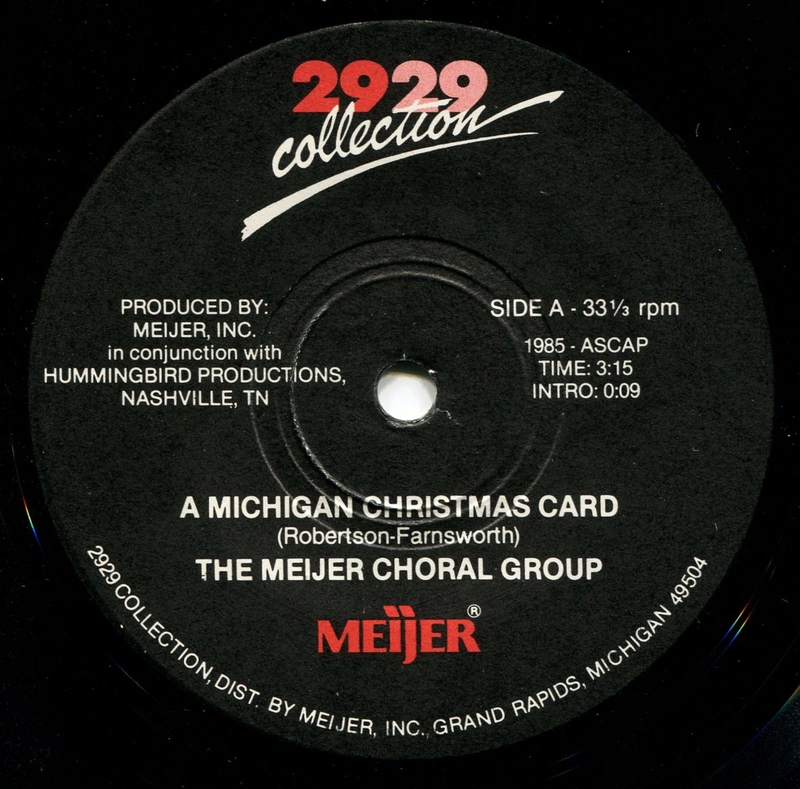 How "Merry, Merry, Merry, Merry" got demoted to "Merry, Merry," I can't pretend to know. I guess they wanted to save on ink. Merry, Merry, Merry, Merry Xmas (or Else)--Ruby Wright w. Cliff Lash and His Orch., 1957. 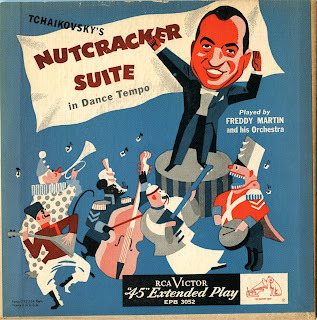 Season's Greetings--Larry Noble w. Pete Pontrelli and His Orch., 1959. 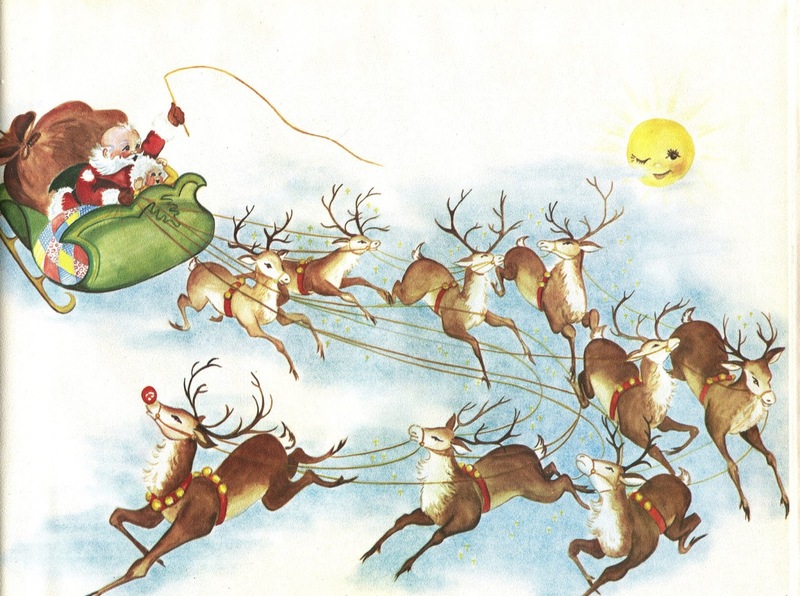 Boofo Goes Where Santa Goes--Linn Sheldon (Cleveland, Ohio, kiddie show host), 1958. 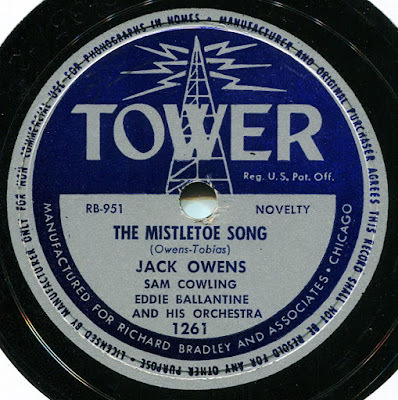 Winter Song--RCA Victor Male Chorus, 1925. 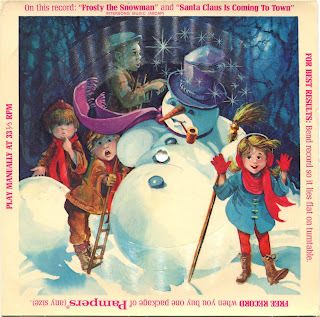 Elizabeth the Christmas Queen--Buddy Pastuck, the Roller Skating Cowboy, 1978. 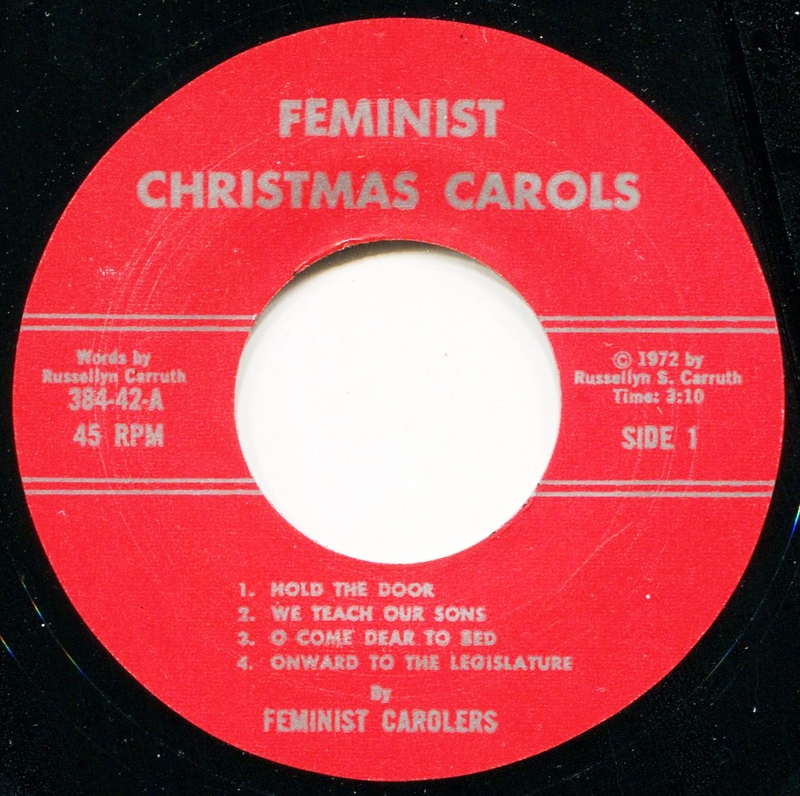 These come from the nine-track 45 rpm EP Feminist Christmas Carols (above). 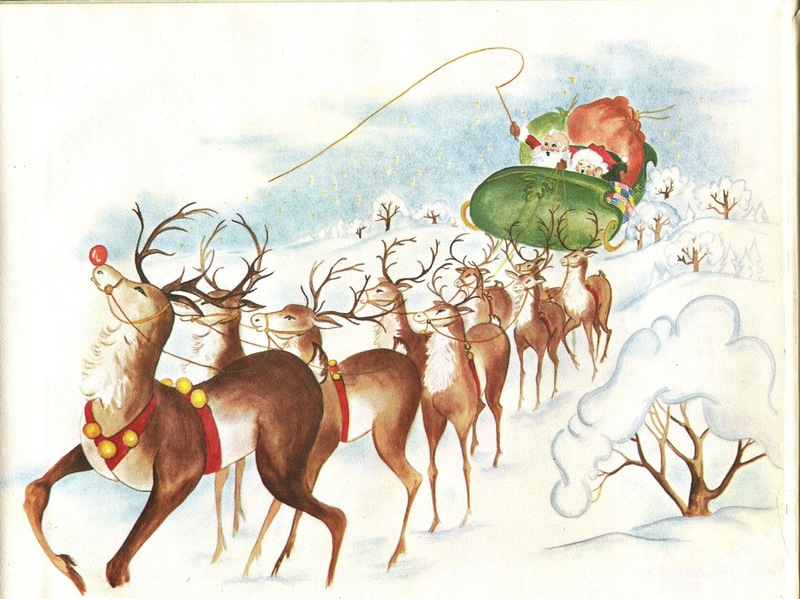 "Hold the Door" is sung to the tune of "Jingle Bells," "O Come Dear to Bed" to "O Come, All Ye Faithful," and so on. The download includes scans of the two lyric sheets included with the EP--you'll need them. All written by Russellyn S. Carruth, 1972. Is the music corny? To an extent, yes. 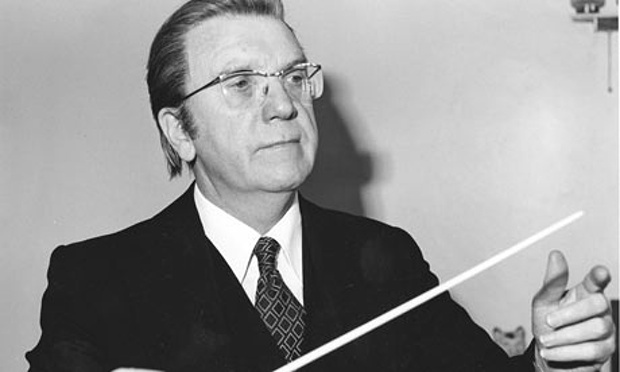 Martin's music was a weird mixture of schmaltz and brilliance. It works for me, and then some. Crack musicianship, occasional swing, state of the art recording quality--what's not to like? Martin had one hell of a band. AND he gave us Merv Griffin, don't forget. 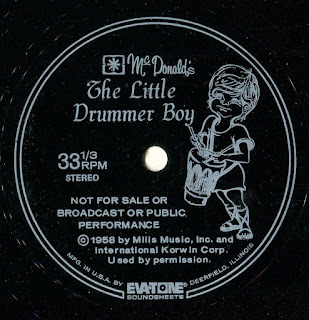 Here's what the eBay ad said: "THE LITTLE DRUMMER BOY EVA-TONE FLEXI RECORD FROM 1958 COMPLIMENTS OF McDONALDS." "Oh, boy," I said in my head. "A McDonald's flexi-style record from 1958! Hm.... The art doesn't look like the right period, but what the heck. I need this one." I bid on it and won. Now, had I looked at all three pictures (I only noticed the cover) and actually read the description in the ad, I'd have learned right off that 1) It's not the fast-food-chain McDonald's, 2) The disc style is way post-1958 (in fact, Eva-tone Soundsheets started in 1962), and the 1958 date is the song copyright, not the date of issue. 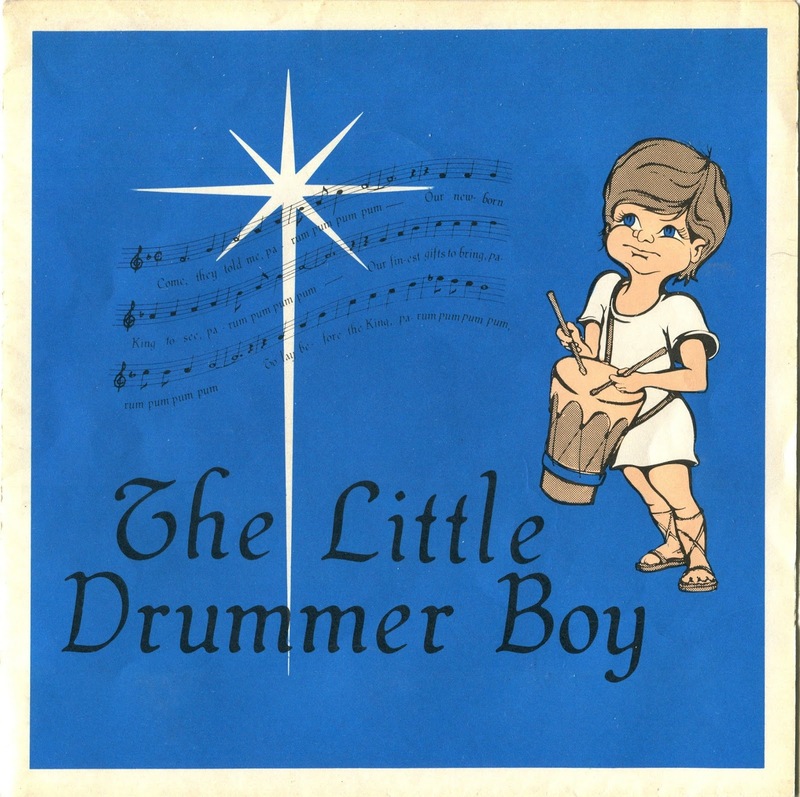 You'll recall that 1958 was the year Harry Simeone tried to claim Katherine K. Davis' Carol of the Drum as his own, renaming it as The Little Drummer Boy. Every clue to tell me this is not a 1958 McDonald's freebie, including the following sentence in the ad text: "This is not the McDonald's fast food chain." Oops. That cold have been an important detail. 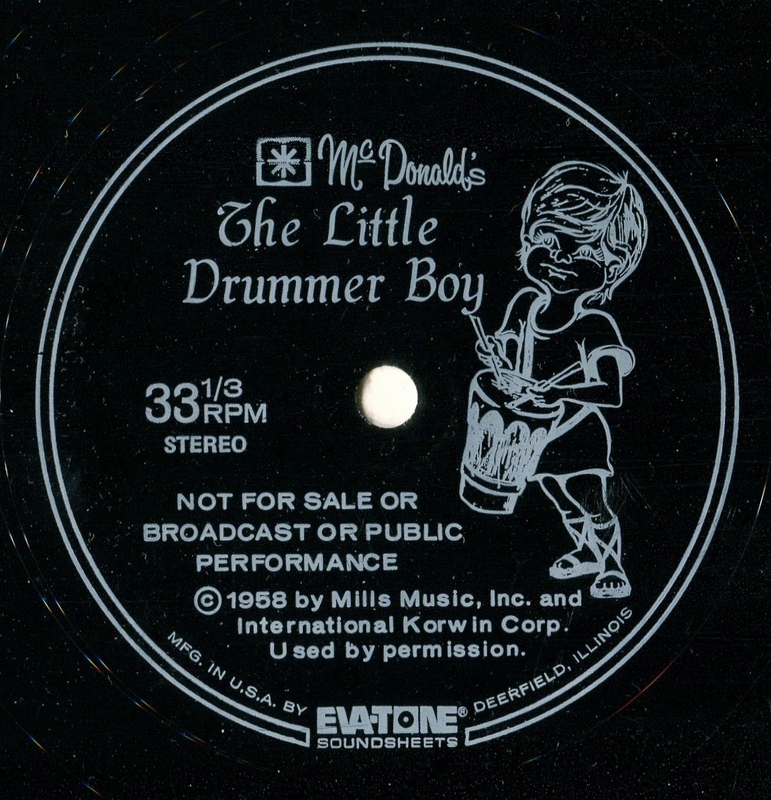 So, anyway, enjoy this circa-1970 McDonald's (not the fast food chain) Eva-Tone Soundsheet recording of The Little Drummer Boy. I are a savvy and informed eBay customer. Frank and Jack's 1956 novelty versions of 'Twas the Night Before Christmas and Jingle Bells fall into the so-bad-they're-fascinating category. 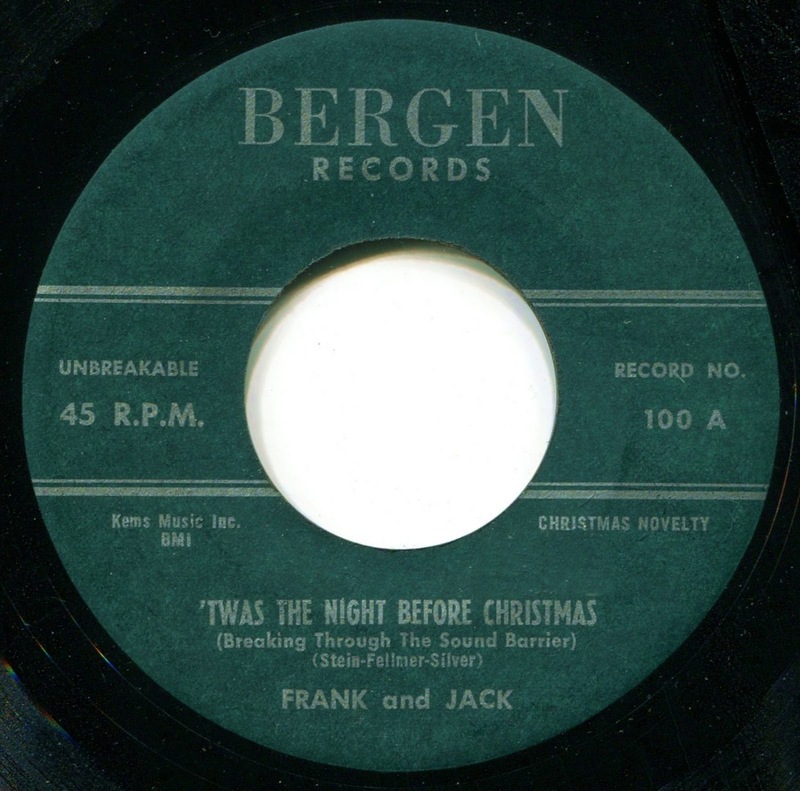 Frank and Jack are trying to be Spike Jones, Dickie Goodman, and Wes Harrison all at once, and it does not work. Yet, somehow, this 45 cries out to be heard, simply because the makers put so much effort into being bad. Because they put so much time and care into constructing one of the What the...? novelties of all time. I have no idea what I'm babbling about. Neither did these guys. Download without delay. By the way, Billboard reviewed this on December 8, 1956 and concluded that the first side ('Twas) has "some funny moments" and that "many jocks will find it useful in the coming weeks." The same person dismissed Jingle Bells as "unfunny." I'd opt for "really, really dumb." Kind of a nice cover for such a cheap LP. The "Mistletoe Singers" is a fake name for whoever and whatever the label (Tinkerbell) could dig up for this effort, and, to my genuine surprise, the album's a pretty fun mix of frequently-released old stuff (a number of Perry Como sound-alike Johnny Cole/Kay sides from the Johnny Cole Wishing You a Merry Christmas LP on Crown CST-165, 1959), and newly-recorded stuff. From the sound of the newer stuff, I'd deem this LP a 1970s relic. No date at Discogs. 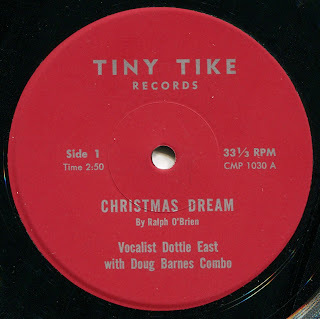 "A Favor for the Little Christmas Tree" may be my favorite track: "Now there's something I'd like you to do that will make it all worthwhile: When the holidays come to an end, don't toss me any-old-where. Instead please plant me once again, 'cause burning me pollutes the air." It's different. The usual cobbled-together holiday cheapie, but somehow cooler than most of its type. Oh, and despite the presence of old Crown material, the company is SPC (Synthetic Plastics Co.). The give-away? A barely legible "Ambassador Record Corp." credit on the back cover. Oh, and the jacket lists the tracks in the correct order. This is getting to be a pattern. 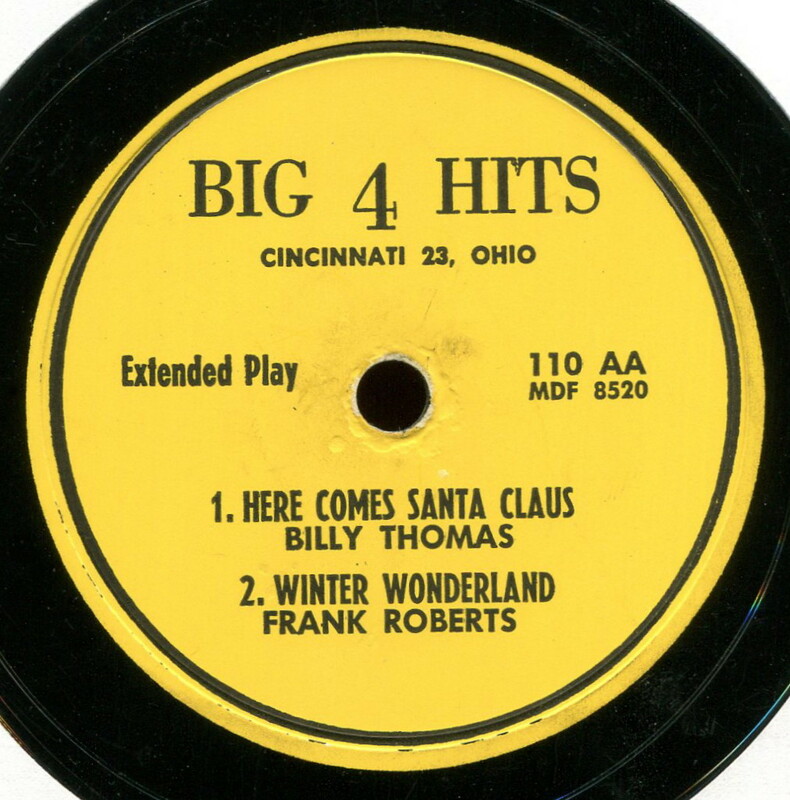 Today, five selections from the Big 4 Hits label, and four from Gateway Records. 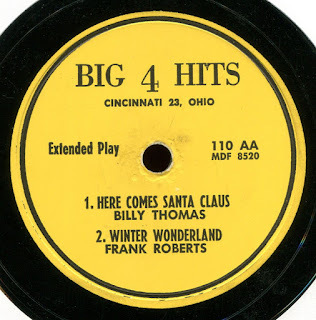 Both were put out in the 1950s by RITE Records of Cincinnati, Ohio. 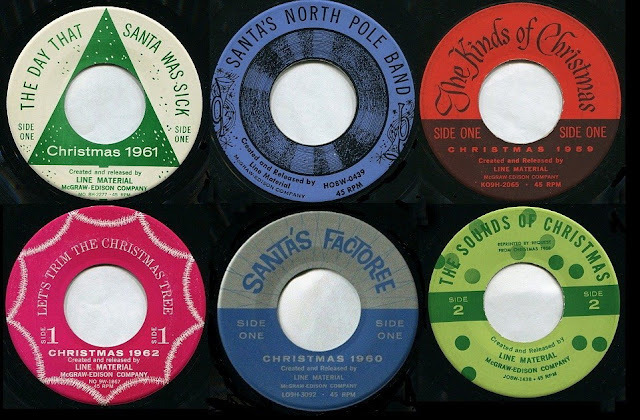 These are sound-alikes, and they range from fun (The Night Before Christmas Song) to "I've lost the will to continue living" (I Saw Mommy Kissing Santa Claus). I mean, I Saw Mommy... is going to bad in any version, even when it's done in the proper cutsie, campy, "Isn't that adorable?" fashion, but the Big 4 Hits version is intolerable. (I really know how to plug my playlists, don't I?) Fortunately, it's the first track, so it's over quickly enough, and there's much better stuff to follow. 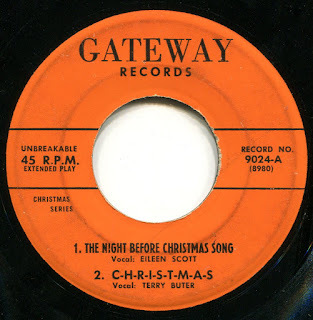 Sources are 78s (Big 4 Hits) and a fairly hammered 45 (Gateway) that I played with my extra-big 45 needle from Rek-o-Kut. Ending track is the dumb aren't-children-singers-cute standard Nuttin' for Christmas, which, though the song lyrics clearly refer to the behavior of a naughty boy, is sung by one Dolly Nunn. Even the lightest Decliker/Decrackler filter application on the Gateway Records EP caused fluttering and drop-outs in the male singing voices, so I went ahead and recorded it minus filtering. Then I went in, obsessively removing some of the louder noise manually. 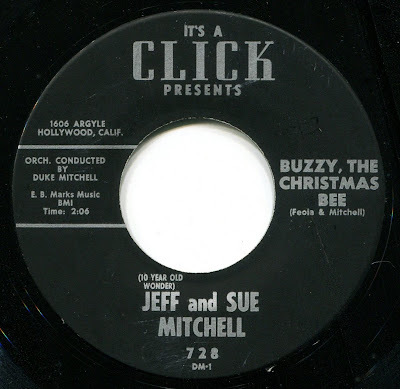 Do you remember when "clicks" were called "ticks" by serious audio people? I do. "Ticks and pops." (Hm. A quick Google check shows the term is still in use.) But to me, they'll always be clicks. Merry Christmas from (who else?) Line Material!! 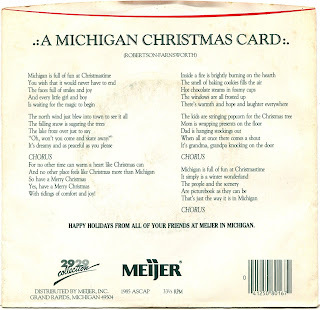 Ahhhh... Line Material Christmas singles--one of the best parts of any Christmas, anywhere. How to explain? How about with a capsule history of the company: Line Material. Click here to hear: Merry Christmas from Line Material! Ripped and de-clicked by Lee Hartsfeld, 2007. 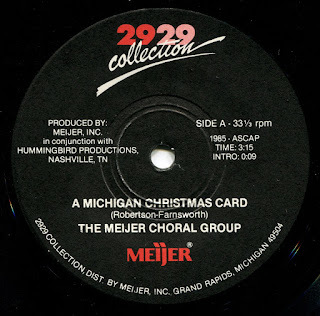 Another Record Corporation of America holiday classic! Varsity, of course, was one of Eli Oberstein's labels, so the no-budget nature of this collection should come as no surprise. No artist credits, BUT (and I consider this a minor Christmas miracle), the tracks are listed in the correct order on the cover!! A possible first. Of course, the label screws them up in one spot, but you can't have everything. The perfect background music for those cheap light-show thingies they're advertising on cable TV (including "Star Shower"). Consult track listing on cover scan. 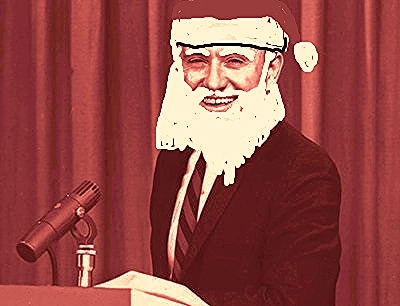 A Merry Mervmas from the late, great Merv Griffin (1925-2007)! Click here to hear: Merry Mervmas! See: The Real Story Behind Merv Griffin's Iconic Song "Christmas City"
Wow. 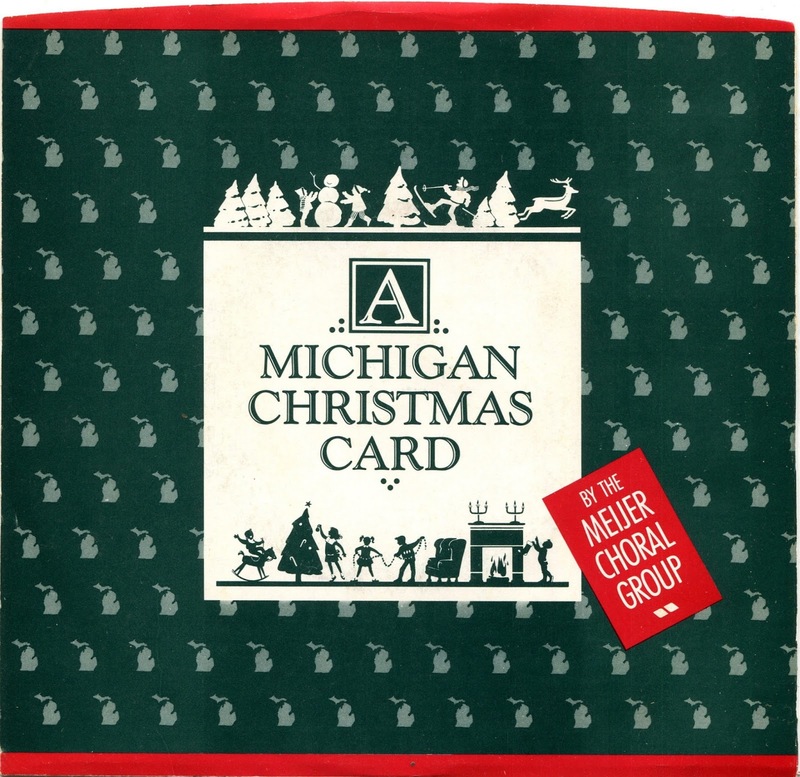 The "pre-owned" stuff you spot on eBay: in this case, a Christmas record card from Beringer's Gulf Service--1918 Wayne Street, Toledo 9 Ohio. "Whoa," I said to myself mentally. "A Gulf gas station, 1918 Wayne Street. We lived next door!!" Indeed, we did. Since there's no date on this disc, I dunno whether the Gulf station was still called Beringer's when we moved next door circa 1962. It's possible. After all, it was still Wayne St. and our pre-zip-code "zone" was 9, so those check out. And it was a Gulf station. But was it still Beringer's? Dunno. Oh, cool instructions on the back of the card--"Best way to play--tape corners to any standard record or to turntable." And the irony is, this is so far the only cardboard-backed disc I haven't had to tape down. It played just fine! 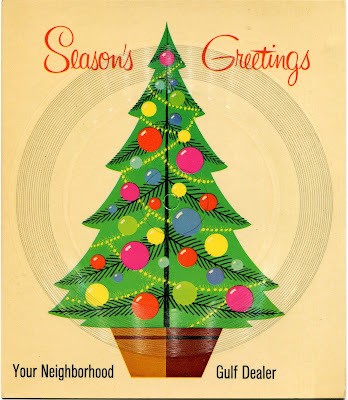 Season's Greeings--Beringer's Gulf Service--1918 Wayne St., Toledo 9 Ohio. 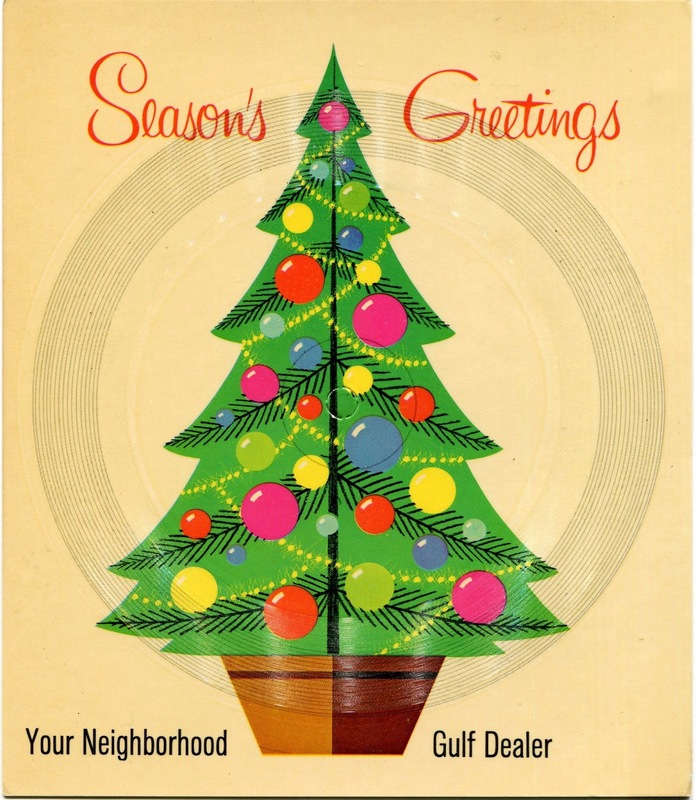 Merry Christmas from the Garcia Corporation! 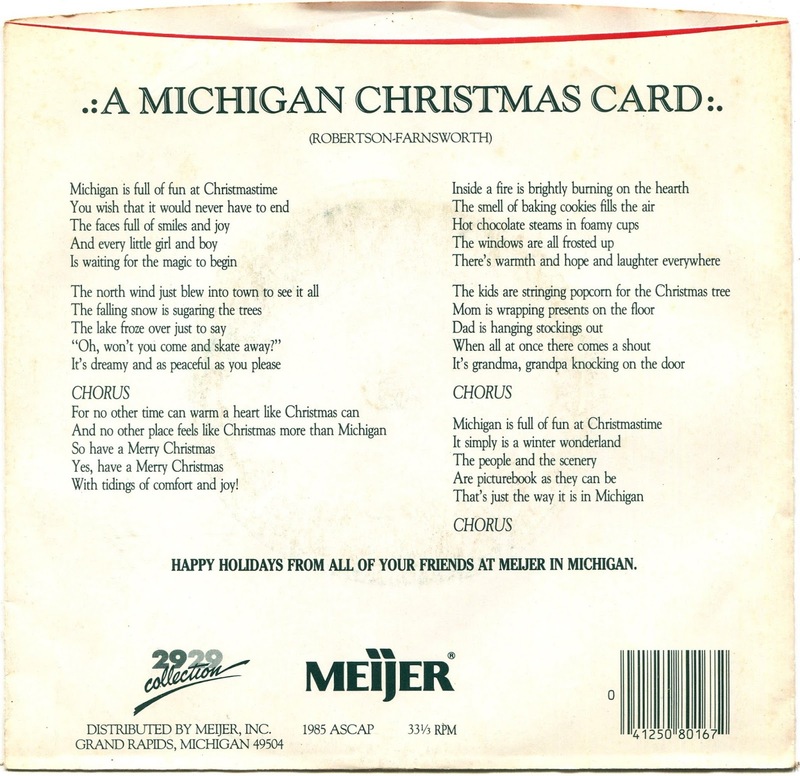 This may be the weirdest company-produced Christmas single of them all, but of course one can never be sure. Two, perhaps, but not one. 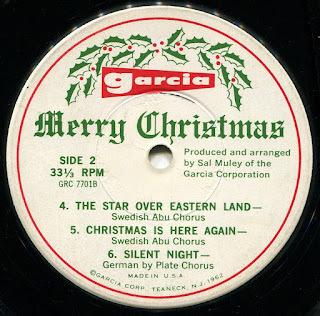 It's Garcia's long-playing Merry Christmas EP from 1962--the Garcia Corp. of Teaneck, NJ, to be exact. In 1980, Garcia became the Swedish ABU Garcia. It's all explained here in a manner that's almost possible to completely follow. If "Abu" doesn't sound particularly Swedish, it's because it's a shortening of "AB Uhrfabriken." So there. ABU Garcia makes highly valued fishing reels. 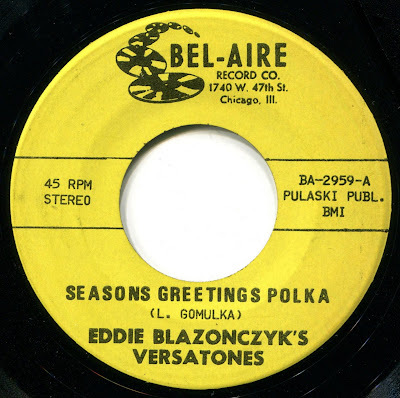 And highly obscure Christmas EPs. And I just accidentally deleted the URL, so let me re-find it. The weather has my sinuses in turmoil, which puts me in space. I regret to report that Garcia had no closing jingle. 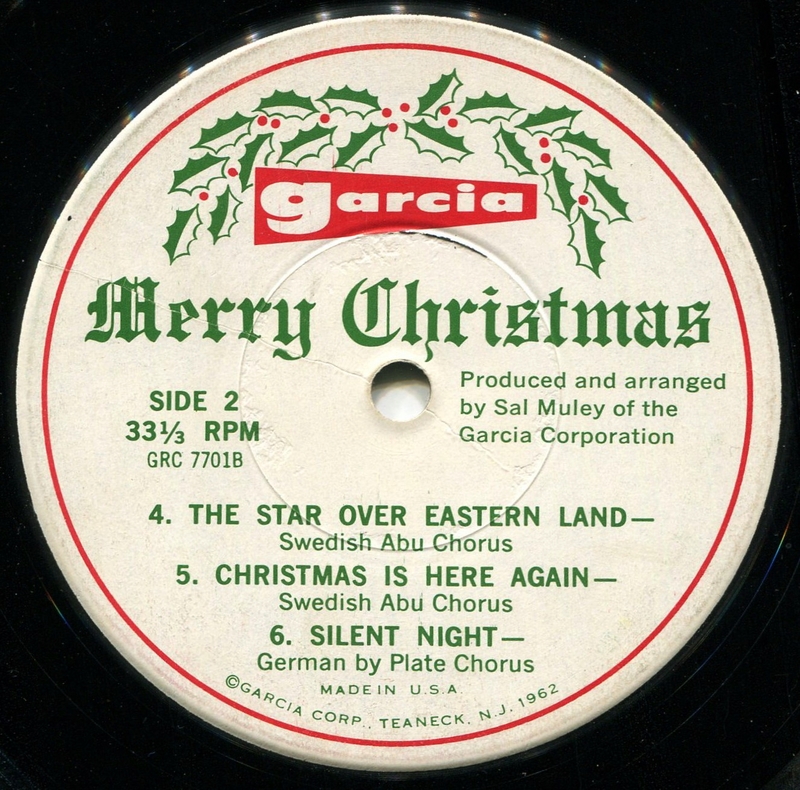 That is, no chorus singing "Merry Christmas from Garcia Corporation fishing poles," possibly because that would be a bear to set to a tune. "It ain't not big, It ain't not small." "The Ain't-Not blooms at Christmas, the favorite time of year." "It never saw the out-of-doors, Because it grows in Macy's stores." The flip is the Carollers crooning "A modern Christmas carol" called Happy Birthday, Dear Christ Child. 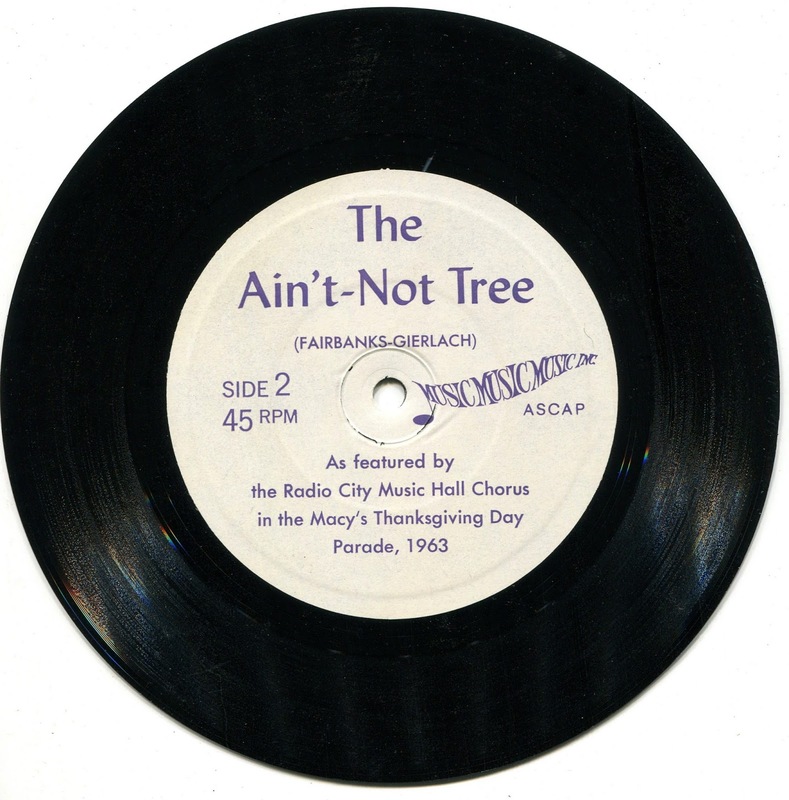 Click here to hear: The Ain't-Not Tree. 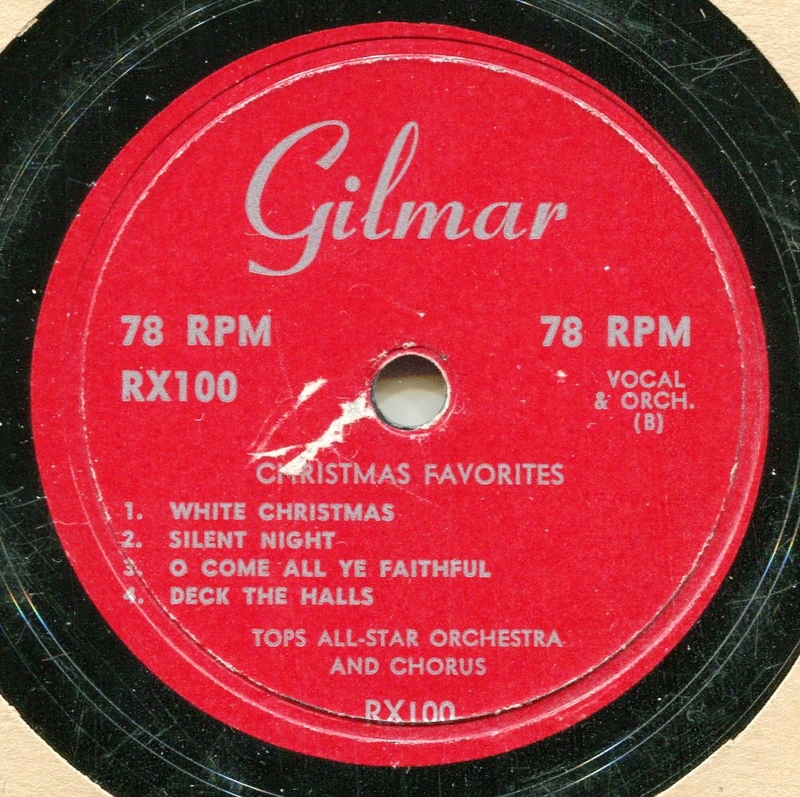 A Gilmar and Tops 78 rpm Christmas! Pretty rough shape, and sounds terrible with my 78 stylus. So I tried an LP needle, and... infinitely better results. That'll happen, sometimes. 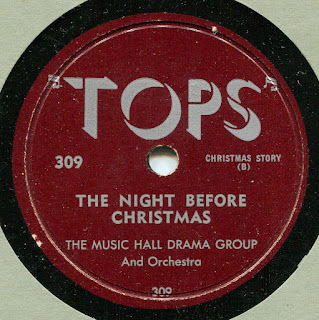 The bonus track--The Music Hall Dram Group and Orch. performing The Night Before Christmas--appears to have originated on the Record Guild of America label. Perhaps Tops purchased the master from it.